Even on a cold and rainy Spring day in May, this hearty and delicious meal will keep you nourished as the grey clouds roll by outside your window. A few shortcuts have been applied for this particular recipe, so you get this on the table quickly, without sacrificing all the deliciousness of a home cooked bowl of soup. To start the soup, heat medium sized pot on high. Add chicken stock, chicken thighs and only half the sprigs of each of the parsley, thyme and oregano bunches. Roughly chop 3 stalks celery and toss into stock. Bring to a boil, reduce to a simmer and cook, covered, until chicken is tender and easily pulling off the bone, about 25 minutes. Half leeks, trim off and discard root end and tough green tops. Slice into ¼ inch half moons, place in a deep bowl and soak with water. Slice potatoes, carrots and celery in ¼ inch rounds or half moons. Tear remaining oregano, parsley and thyme leaves off stems and roughly chop. Heat large stock pot on medium heat. Add 2 tablespoons olive oil. Toss in leeks and sauté until soft, about 2 minutes. Add carrots, potatoes and chili flakes and cook, stirring occasionally, until soft, about 4 minutes. Add celery, cover and cook on low, stirring occasionally, until chicken is finished cooking. When chicken is done, remove from pot and set aside to cool. Remove celery pieces and herbs with a slotted spoon and compost. Add stock to sautéed vegetables in large pot. Toss in chopped herbs, peas and noodles. Bring to a boil, then reduce to a simmer and cook until noodles are soft, about 8 minutes. Once chicken cools, remove skin and discard. Remove chicken from bone with a knife and shred with hands or thinly slice with knife. Add chicken to soup and season to taste with salt and pepper. To serve, spoon into bowls, top with grated cheese. 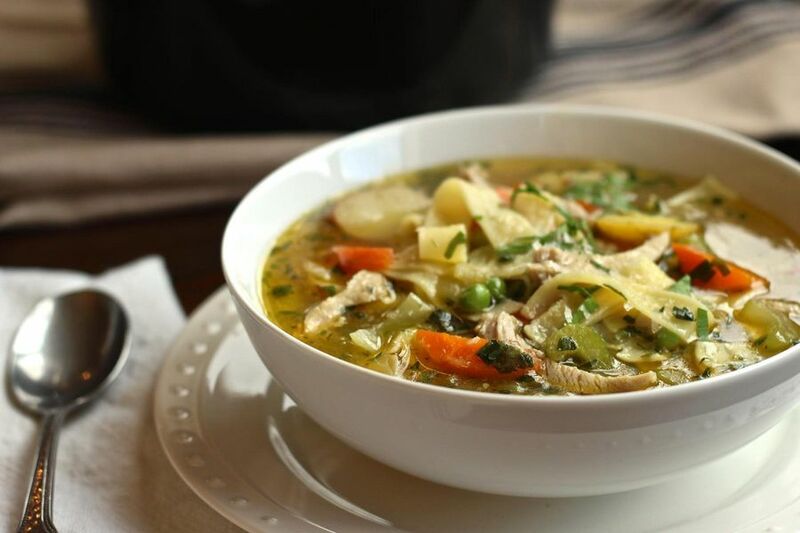 This entry was posted in Appetizers/Starters, Herbs, Lunch, Main Dish, Pasta & Rice, Poultry, Soups, Vegetables and tagged Carrots, Chicken, Chicken thighs, Egg Noodles, Leeks, Peas, Soy-Free. Bookmark the permalink. I love that your recipe uses chicken thighs and cooks them with skin and bone on! I think that makes the best flavor! Thanks for sharing! Yes, chicken thighs just happen to be my favorite parts because they are the most flavorful, moistest cut of chicken. Another reason why chicken thighs are my favorite proteins to cook is that they are so easy to prepare for lean, speedy and economical dinners, especially if you are on a budget.